WASHINGTON—The Federal Reserve raised benchmark interest rates by 25 basis points after its two-day policy meeting concluded Sept. 26, and signaled it wants to continue gradually lifting them through 2019. The move, which was widely expected, puts the federal funds rate at a range of 2 percent to 2.25 percent. That rate helps determine rates for mortgages, credit cards and other consumer borrowing. It’s the third increase this year and the eighth since December 2015, when the Fed started inching rates up from effectively zero percent. “Our economy is strong. Growth is running at a healthy clip,” Federal Reserve Chairman Jerome Powell said during a press conference. Fed policymakers presented revised projections of future rate moves, as well as their outlook for the economy, unemployment, and inflation. According to the new estimates, economic growth will be 3.1 percent in 2018, an upward revision from the 2.8 percent projected in June. And growth is expected to decelerate to 2.5 percent next year. Economic growth hit a 4.2 percent annual rate in the second quarter, exceeding the Fed’s estimates. And the unemployment rate sits at 3.9 percent, near its lowest level in 18 years. Household spending, as well as business investment, have grown strongly. “We expect the job market to remain strong,” said Powell adding that their projections for the unemployment rate are 3.7 percent for this year and 3.5 percent for 2019. Meanwhile, the Fed’s headline inflation projection for 2019 edged down to 2.0 percent from 2.1 percent. Powell also commented on the ongoing trade war and its effect on inflation. “We’ve been hearing a rising chorus of concerns from businesses around the country,” Powell said, but he added that the effect of all tariffs at the aggregate level is still relatively small. The policy meeting also marked the removal of the phrase “the stance of monetary policy remains accommodative” from the Fed’s statement. The term “accommodative” meant that interest rates are sufficiently low to spur economic growth and reduce unemployment. “This change does not signal any change in the likely path of policy. 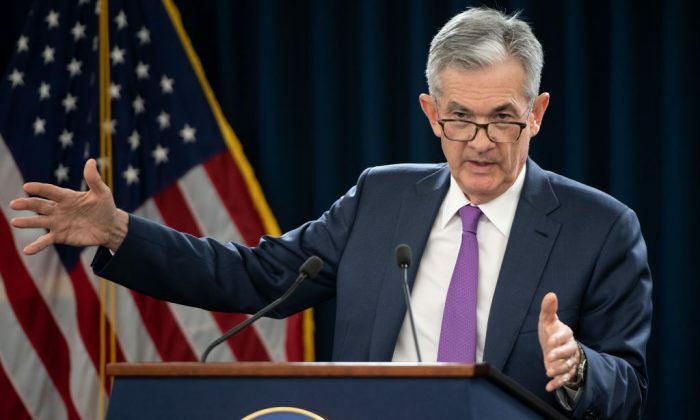 Instead, it is a sign that policy is proceeding in line with our expectations,” Powell said, adding that the Fed still expects further gradual increases in the interest rates. The Fed cut interest rates to near zero during the 2008 financial crisis to help stimulate the economy. In 2015, after seeing the signs of economic recovery, the central bank put an end to “the extraordinary seven-year period.” Since then, policymakers have been tightening monetary policy by gradually raising short-term interest rates. The Fed projects one more rate boost before the end of the year and three in 2019. According to Goldman Sachs, low unemployment could fuel more aggressive rate increases next year. “Looking ahead, we continue to expect quarterly hikes through end-2019, with the risks tilted to the upside,” according to a Goldman Sachs report. “In light of the economy’s impressive growth momentum, the upward trends in wage and price inflation, and the limited overall tightening in financial conditions achieved so far, on net we think the risks to the funds rate are tilted to the upside of our baseline forecast,” the report said.